Kitchener~eating in the nest...could there be a pip? Last week on June 12th, that being Tuesday, the resident male from Kitchener named Lucifer was found grounded and picked up by the Kitchener Animal Services. He was taken to rehab and has suffered a fractured wing. The good news is that the fracture placement is perfect for pinning and he will be getting the surgery to repair the wing. 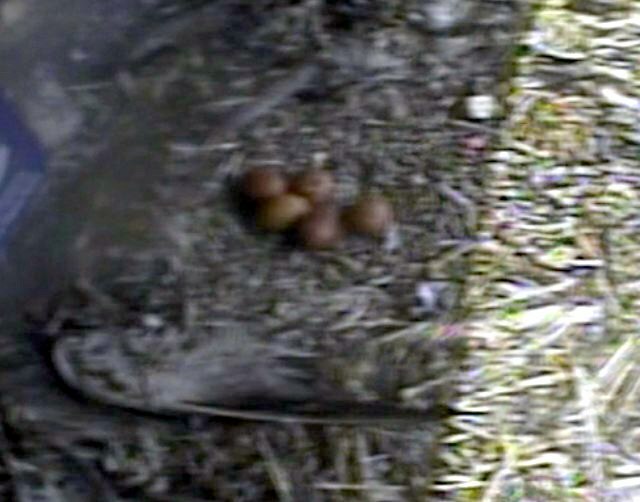 That has unfortunately left Mystery, the resident female, alone with the 4 chicks for the past 5 days. The CPF has been monitoring the situation very closely and the great news is that she has been keeping up on their feeding with excellent regularity and is so far handling the whole situation like a pro. Rudy spent some time yesterday doing site observations and reports that he currently sees only her, no other male in the territory as of yet. She roosts on the top of the nest box where she can survey the territory and be near the chicks as well. 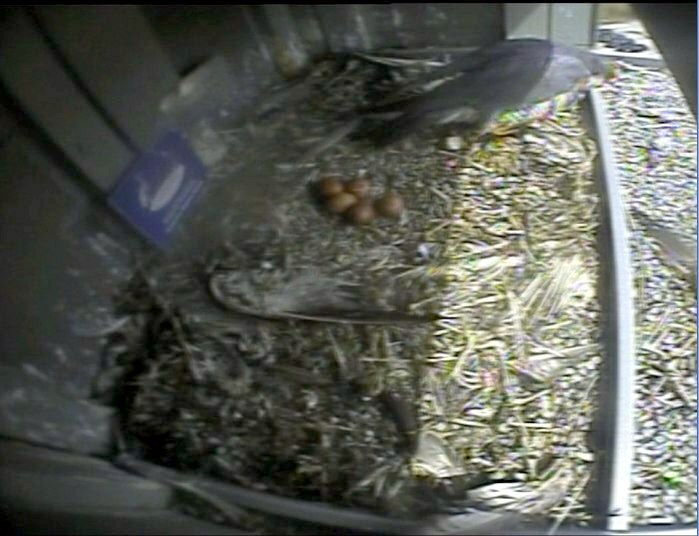 Yesterday I saw 4 feedings by the female and all 4 chicks ate well. Today in between caring for our educational birds in this heat, I was able to witness on the camera 2 feedings for sure that again saw all 4 chicks get a great feeding. Another camera watcher caught another feeding just before dusk tonight. 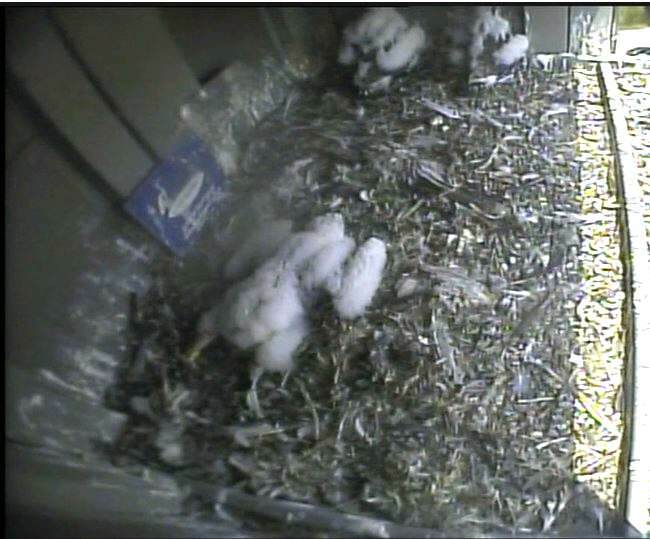 The banding is set for June 28th and we will be monitoring very closely every day to ensure that all continues to go well for the young ones. We are also hoping to get more site visit observations to see how well Mystery is doing outside of camera range. So far so good and all is well as of today. Lucifer is getting great care and will be on the mend soon and Mystery is doing an amazing job with her chicks. 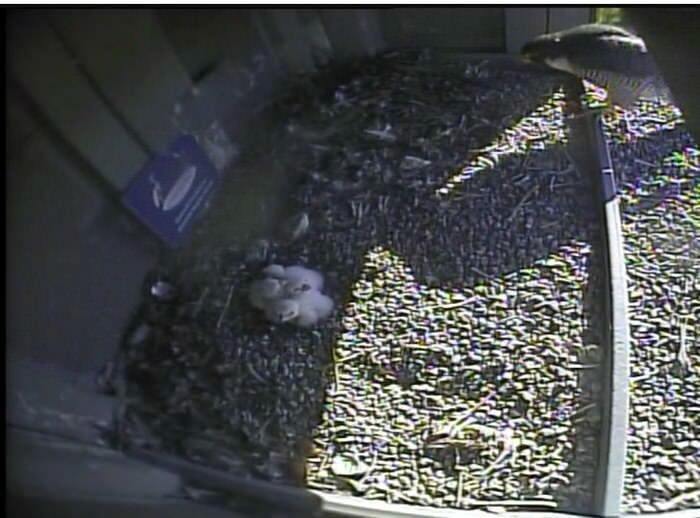 We will continue to keep a very close eye on this nest and post updates as we have them for you. Oh Dear!! Thanks for bringing that info here, DEF...YIKES...so glad they are keeping an eye on the situation!! RE: Kitchener...I had seen the info on the banding...it was curious at how low the female weights were. Maybe because of their age? The low weights may be because of the fact that the mother is a single parent now. Kitchener...from this morning...I only saw 3 the short time I was watching..
Kitchener~first fledge...I'm still trying to figure out what happened to #4. 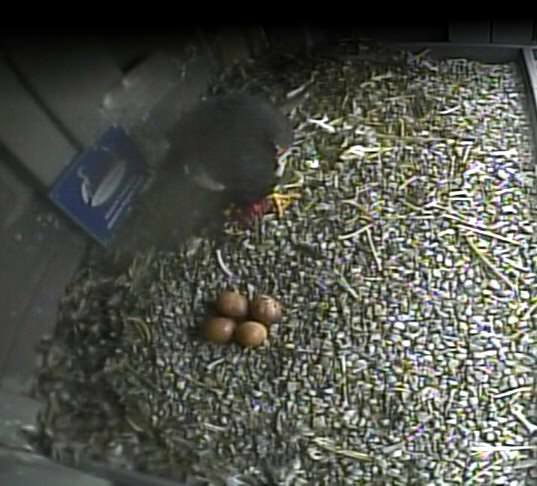 On Saturday Sadie, one of the peregrine falcon chicks nesting in CTV Kitchener’s communications tower, made her first flight. She took to the skies around 7 a.m., making her way from roof top to roof top in the area around Mary Street. Great article and video, Kittenface- thanks for posting it! Lucifer is flying once again in the skies above Waterloo Region. The peregrine falcon was found last June with a broken wing. The injury meant Lucifer was unable to return to his nest in CTV’s communications tower, leaving the care of his four fledglings to their mother. Surgery was done on Lucifer’s wing and he’s spent the last several months recovering at the Hobbitstee Wildlife Refuge. Caregivers were especially concerned about Lucifer's ability to conduct sharp turns and other precision movements after his bones healed. They removed the pins and external fixator in mid-August and the falcon was given a few weeks of rest before they started flight retraining. Earlier this week they decided Lucifer was ready to leave their care. Chantal Theijn, one of his caregivers at the refuge, was there was there when they let Lucifer out of his cage. They hope Lucifer will be able to reunite with his falcon family. I have very strong opinions about this release but will not say anything. I am saddened that Lucifer did not make it. Wow, Kittenface! Great to have another cam in Montreal! Is the cam live for 2019? ?